Can Your Valentine's Day Chocolate Prevent Heart Disease? Sometimes staying faithful to a healthy diet can be tough, especially during a holiday like Valentine’s Day when everywhere you turn are ads and displays for chocolate candy. But this year, thanks to the results of recent health studies, you might consider giving a sweet to your loved one – or yourself - in the name of health. The results, published online in the medical journal Heart in June, 2015, found that 17.4 percent of those who didn’t eat chocolate developed or died of cardiovascular disease, compared to 12 percent who consumed the most chocolate. The study followed nearly 21,000 Norfolk, England residents for 11 years. “If you’re a chocoholic, the news out of England is tantalizing: middle-aged and older adults who eat up to 3.5 ounces of chocolate a day (that’s more than two standard Hershey bars) seem to have lower rates of heart disease than those who spurn chocolate,” writes Dr. Howard LeWine, chief medical editor of Harvard Health Publications. Listen to NPR’s Allison Aubrey interview with other medical experts commenting on the study. 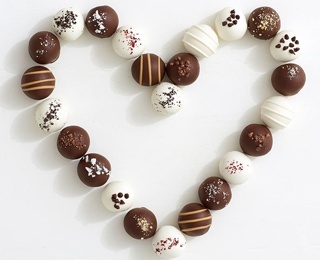 The England study found that all chocolate, including milk chocolate, had cardiovascular benefits. Other studies, though, have found only dark chocolate, rich in antioxidants, were beneficial, but that might not always be the case, according to the Cleveland Clinic. “Although it was once believed that dark chocolate contained the highest levels flavanols, recent research indicates that, depending on how the dark chocolate was processed, this may not be true. The good news is that most major chocolate manufacturers are looking for ways to keep the flavanols in their processed chocolates. Harvard’s Dr. LeWine, who as a result of the England study now tells patients that eating chocolate in moderation is OK, favors dark chocolate too, with at least 70 percent cocoa. Dr. Frank Lipman, founder and director of Eleven-Eleven Wellness Center in New York City, has put together a list of healthy chocolate manufacturers. Why not add Vitamin C to the mix and give your sweetheart a box of chocolate covered strawberries? Better yet, cook up a batch yourself. The recipe is easy, and we all know that homemade gifts are often good for the heart - both for the giver and the receiver. Gently rinse strawberries and dry on paper towels (berries must be completely dry). Line cookie sheet with waxed paper. In 1-quart saucepan, melt chocolate chips and shortening over low heat, stirring frequently. Remove from heat. Dip lower half of each strawberry into chocolate mixture; allow excess to drip back into saucepan. Place on waxed paper-lined tray or cookie sheet. Refrigerate uncovered about 30 minutes or until chocolate is firm, or until ready to serve. Store covered in refrigerator so chocolate does not soften (if made with oil, chocolate will soften more quickly at room temperature).